Developed from scientific and clinical research since 2005, the ARTAS Robotic System is a state-of-the-art medical device that safely and effectively extracts hair grafts for FUE transplantation. Rigorously tested and cleared by the FDA and other international regulatory bodies, the ARTAS® is the world’s only Robotic System for hair transplant surgery automation, and allows our highly trained surgeons to achieve larger cases of truly outstanding results, safely and efficiently. Actor & Farjo Patient Sanjeev Bhaskar meets the Farjo ARTAS® back in 2015! While no two ARTAS® FUE procedures are ever exactly identical, they do follow the same essential steps from start to finish. The ARTAS robotic procedure is a minimally invasive hair restoration solution that uses digital imaging and precision robotics to harvest healthy grafts for transplantation. Similar to standard FUE, there is no need for the surgical removal of a strip of tissue from the back and sides of the head, no linear scar left after surgery and no need for stitches or staples to close the wound. The benefit is a quick recovery time and the ability to return to normal activities and work sooner. The ARTAS robotic hair transplant provides the same natural looking results as any top quality hair transplant procedure. After the procedure, you are able to wear your hair any length or style with confidence. How is the ARTAS robotic hair transplant different than 'Hair Plugs'? Old fashioned ‘hair plugs’ included the harvesting of large patches of hair that resulted in an awkward and unnatural appearance once implanted. In the ARTAS robotic procedure, hairs are harvested in their natural groupings and then transplanted individually. Individual transplantation provides you with the look you desire, including a great looking hairline and a fuller head of hair. Because the ARTAS robotic system selectively harvests individual hair groupings rather than removing a large area of scalp requiring sutures, there is minimal scarring in the donor area. Hair can be worn fashionably short, or in longer styles, whatever you prefer. What is the cost of ARTAS Robotic Hair Restoration ? 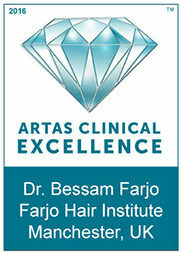 What is the treatment regime of ARTAS Robotic Hair Restoration System?